North Star Toyshas been creating the finest wooden toys since in 1979 and are proud of their 30 year history of making non-toxic, handcrafted wooden toys. Before being eco-friendly was “in” North Star Toys were perfecting their craft. This U.S. owned and operated family run business has their North Star elves busy working to bring you affordable and quality toys this holiday season. 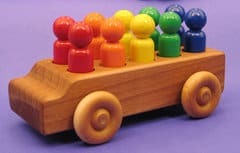 The Rainbow People Mover is a favorite of mine because it is so colorful and a hands on toy that is perfect to stimulate young imaginations. 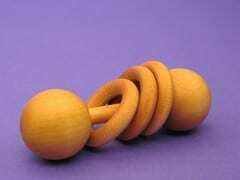 This toy is 8 inches long and is made of birch and alder with non-toxic paint. I love that this toy has figures that can be “arranged, matched and counted by color.” My three year old son is having a blast playing with the Rainbow People Mover and loves to arrange the colors and people. We have even practiced basic adding and subtracting using the Rainbow People Mover. My neighbor has a young son with autism who enjoyed this toy so much that she is going to surprise him with his own for Christmas. 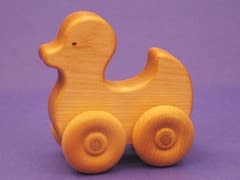 I can attest to the fact that this wooden toy is very sturdy and has held up well to my three young children which is saying a lot. At only $25.00 the Rainbow People Mover is a real bargain for such a high quality and fun toy that is sure to be played with for a very long time. I invite you to visit North Star Toys and view their entire selection of wooden toys because when you purchase from North Star Toys you are supporting a U.S. based business and that uses environmentally friendly practices. More importantly, you would be buying some of the finest quality wooden toys that I have ever had the pleasure of giving my children to play with and enjoy. I like the Big Rollie Race Car. The Busy Boat is so cute!! I like the Paddle Wheel Boat…great for the bathtub, thanks. I like My Mama’s Love – Kiss My Boo-Boo at your OSS.